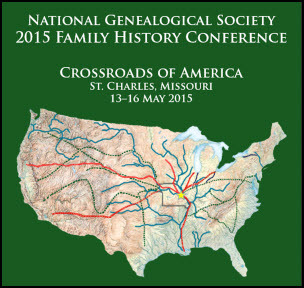 Hard to believe that after all the hard work, all the preparation, all the efforts of the Conference Committee and volunteers and local host society, the National Genealogical Society Conference for 2015 is getting underway in St. Charles, Missouri! So we’re all off to the Show-Me State, where preliminary events are going on today, and the conference kicks off tomorrow morning. And that may make it a bit tougher than usual to stay current with blog postings, what with everything else going on. 12:15 p.m., Session W133, “The Rest of the Story,” at the luncheon of the Genealogical Speakers Guild (GSG). Beyond the record is the rest of the story: how to find it, when to tell it…and when to keep it to ourselves. 9:30 a.m., Session T211, “Certification: Measuring Yourself Against Standards,” with Elissa Scalise Powell, CG, CGL, and Michael S. Ramage, JD, CG. In this interactive forum, current BCG associates share various pathways to certification and how to begin the process. The second hour focuses on practical tips for preparing an application portfolio. 4:00 p.m., Session T251, “Living With Legal Lingo through the Records of Missouri’s Boone Family,” BCG Skillbuilding Track. Using records of Missouri’s famous Boone family, learn how to understand just what the legal lingo in those records means–and how to use it. 8:00 a.m., Session S403, “The Law in Yankee Blue: Federal Military Pensions after the Civil War.” More than two million men served in Yankee blue. Learn how federal law did–-and didn’t–-reward them with pensions after the Civil War. 9:30 a.m., Session S413, “The Law in Confederate Grey: State Military Pensions after the War of Northern Aggression.” The South’s loss in the Civil War didn’t deprive its soldiers of pensions for their service. Learn about state laws and pensions for Confederate veterans. 12:15 p.m., Session S432, “The Prizes of War: Pirates and Privateers in the National Archives,” at the luncheon of the National Institute for Genealogical Research Alumni Association (NIGRAA). Tales from the National Archives, from Revolutionary War letters of marque, to War of 1812 prize claims, to trial of Confederate privateers as pirates, and more! Hope to see you in St. Charles!